Summary: Trading binary options is easy when you use the Binary IQ software. High quality signals flood your trading accounts all day as this strategy is built to do one thing, dominate. Yes, it’s here, Binary IQ is here and we can’t be more excited or proud to unveil a trading strategy that utilizes the most intricate complexities of the market to provide DOMINANT TRADING SIGNALS. This personal trading strategy has been in the Binary Today family for three years. Now, in order to renew faith in binary options we are providing access to a trend-following strategy that offers wins by landslide margins. Don’t keep sweating your trades to the last second. Use signals that will have you in a winning trade from start to finish. The Binary IQ software has everything you need to be successful. Trading isn’t easy but with BIQ you will receive pinpoint signals in every trading session, that will tell you exactly what to do. These signals are perfect for traders who want to trade just a couple hours a day as a hobby, and even more serious traders that want to trade as a primary income source. Signals for both 5 minute and 30 minute expiry times. Perfect for new traders and veterans alike. Works with any binary options broker, in any country. Signals provided 24 hours a day. Guaranteed to grow your binary trading accounts. It’s obvious that the Binary IQ is developed by real traders because the strategy is broken down in some detail. The BIQ disseminates dominant signals with a unique trend following strategy. The strategy takes advantage of confirmation bias and herding as a means to recognize trends. The strategy is based on the technical analysis of market prices, and will always look to provide stable entries. Instead of trying to anticipate reversals or breakouts, the signals respond to these opportunities when they arrive. This ensures that there is no guess work and that every single signal is following the strategy properly. To simplify, please review the image on the right hand side of the page which shows the entry, and expiry point of a normal trade. Signals are sent to your MT4, E-mail, or Phone exactly when Binary IQ notices an opportunity. The trade will provide all the pertinent details. It well tell you when to enter, what asset to trade, and the exact expiry time (5 minute or 30 minute). It’s not possible to get confused, or take the wrong trade, because the process is simple and straight forward. See exactly how effective these signals have been for John Kane by viewing the last 6 month winning percentage here. Each test is completed using all the latest technologies provided to ensure that every result is accurate to 99.9%. You don’t have to go it alone in the binary options market any longer. Take advantage of laser accurate trading signals and grow your account at a rate you’ve always hoped. You deserve to win more trades, so join the Binary Today readers and take your trading to the next level. As promised, we are providing a 15% coupon to make this product more accessible to everyone. It won’t take long to earn back the purchase price of the BIQ, but we still believe that everyone deserves this coupon for being patient during the launch. so which signal software you recomend me to purchaise ? for 5 mins trades specially. only. IQ or TODAY 5 ? or ? Ayrex has a 15min, 30min and 1hour timeframes. Just click on the currency pair, click high/low, on the expiry time click the arrow next to the current time to set it to 15, 30, 45 or 60mins. It ain’t difficult, you just need to look around a bit. Just purchased binaryiq. However, I have not received any instructions on how to set up on meta trader 4 plus any other useful info associated with my purchase. i do not have members area on binaryiq site login either. very frustrated. i have contacted support and nothing. seems that the software is on the platform but says my access is denied.Your not authorized. Re-attach indicator to chart. What does that mean? im logged in so i dont know. Hi Cheryl, go to your email inbox and check the junk mail. The registration link is sent automatically when you order. As for support, they answer very quickly, so it’s possible their emails are in your junk mail too. Once you use the registration link, you can access the members area and set the system up properly within a few minutes. Im so happy with all the responses and support. Now it is time to trade. Hi Cheryl, how’s your trading going??? Going great, I assume everyone is happy picking up winners. Nothing but WINS for me! If I may ask, What specific strategy are you using Lamar? Man, so many comments here I need a full day to go through them all. That being said, I’m happy to see that they are all happy customers. I am too. Hello guys. Look, yesterday i bought BIQ and set it on my MT4. I set it on 15 charts with SecondTF at 5 and SecondExpiry at 30. So i understand i should recieve signals for 30 min, right? My charts are on M5. My LowRisk filter is TRUE. But yet after like 12 hours working, still any signal from it… Is there a time when there is a peak of signals? Should i have recieved any signals? Did i do everything right? I recommend watching the video again, and contacting support. They are your best bet every time. Sure they are! Sent them a few emails and could solve the problem. The point is that with the charts set to M5, they generate too few signals. So they said to set them to M1 and BIQ would generate both 5 and 30 minutes expires signals. So far, 2 signals. 1 5m and 1 30m. 30 min ITM, 5 min OTM. I haven’t heard from Grimes in a long time James, I wouldn’t expect a video from him any time soon. Last I heard he was trading frequently with Binary IQ and Binary Today 5, but not spending much time on his computer outside of that. I’ve been able to triple my account in the past 3 weeks with these low risk signals. Glad to hear that Shelly. The Low Risk filter really seems to be having a positive impact. Hi Shelly , great news to hear such positive results . May I ask if you’re having these results with particular pairs / certain times ? I trade whenever I’m home, so that can be a bit sporadic. I haven’t felt that specific times has played a role in much of my success. I do use specific pairs though, basically my main trick is that if 1 pair loses a trade, I don’t trade that pair the rest of the day. I feel like this helps because I’ve seen the signals read a pair poorly for an entire day many times. This depends on the day. I would say that I never have an issue where there aren’t enough signals for me to trade. I always have enough trades. Hi Shelly – Do you verify low risk signals with the in-built trade assistant before placing trades? Thanks. Hello John, the access link to buy Binary IQ is not working, please i want to buy another licence. Problem resolved. Thanks for pointing it out Austine. Are you using the software in low risk? Hi Temitope, you get one license, it isn’t shareable. If your computer crashed you would just login to the members area and download the software again. I’m doing low risk now too. Great David, it’s performing really well. i love your 3 softwares but i still not if i should buy binary iq or today 5 or binary today trader in first , if you have an advice for start i take it :). Hi David, you can’t go wrong with any of them. I recommend going to each of their websites and just picking the one you feel most excited about. I have a question relating to placing trades………do you feel that this system would be effective if I wanted to place the trades directly on the MT4 system? In the sense I would want to capture PIPs, in lieu of binary options. I would feel more comfortable in working through the MT4 system to directly trade. Also, is there a way for do or forward a chart (granted after I purchase!) of your/the historical statistics chart of the backtesting you performed? In this way, I could calculate the realtime ITM percentages and fine tune which hihest percentage trades to take. I find this all super interesting and am thinking about purchasing binarytradertoday, Binary IQ and Binarytoday 5 so I can test all three systems. I would also want the trade assistants as well, so I can really test everything. Keep up the great work……..I would like to let you know what my tests produce. Yes John, you could open the trade in MT4 and close it after a few minutes, or even set a trailing SL. I look forward to hearing more about your tests, and the pip potential of these systems. Hi Jane, there will be very few signals on low risk mode. Hi Stanley, your best bet would be to email support. My guess is you only have a few charts open, so no signals have come yet, and you need to open more. John, emailed the tech people and found out what I was doing wrong; my mistake. Got a couple of signals, did demo trades and won. Next I will work on learning more and also demo trading to get the feel of it before I trade real money, but so far I am pleased. The support is really very good! I wish you a lot of ITMs!! I will start soon, too! Hi Guys , could I ask what times people are finding success with Pauline’s low risk strategy ? I’m using the low risk strategy whenever I’m awake. As soon as a wake-up I throw my computer on and that I do whatever I need to do throughout the day. If the alert comes I walk over to the computer and I place the trade. Using low risk signals has increased my in the money ratio to just a take over 77%. How often does the signals appear? with m1 and m5? Hi Kenni, that all depends on how many charts you have open, and whether or not you have the light risk filter set to true or not. Started following Pauline’s low risk strategy and I’m seeing a perfect winning ratio too. I think the Binary IQ guys might want to put the low risk filter on by default. I have set the BIQ in low risk and the news filter to true. I have set the indicator to send me the signals to my iPhone and I take the signal right away without looking to the trade assistant. I have done this yesterday and guess what, I took 5 trades and they are all winners. Really so easy no analysis at all. I am trading 15 currency pairs and gold. You will not get many signals, but you will get high probability winning signals. I am trading all available pairs in CToptions. I think I will I will go for bigger trades soon. I’ll update after one week. I forgot to mention that I trade M1 charts only, 5 minutes expiry only. I have added the 5 min charts to trade the 30min expiry. I will take the trades without any analysis. What session are you trading? I trade anytime. You will not have many signals, but you will have high probability winning signals. This is for both M1 and M5 charts, 5min and 30min expiry trades. I just purchased IQ, will use a low risk set up for two weeks on a demo and see how it goes. Hopefully I will get some trades as I can only trade the New York session after work. Still using the same Low Risk technique. This week I’m 7-0. This is really useful, and I’m going to start investing more per trade to take advantage of this level of success. Are you stating that just because you changed the settings to Low Risk that the signals you started to receive have given you a 7-0 win rate so far? Do you just click the trades without cross checking with the Trade Assistant? Do you bother to look at the trend to confirm that it’s in sync with the signal direction? It would useful if you could provide more details about your new strategy. Yes, I have my settings on low risk. I always check the trade assistant. It’s hard to avoid it since it’s right in front of me, but I don’t think I need to. Lately I’ve been trying something different, and I thought I should share it. I’m using Binary Today Trader a lot lately because the signals have been awesome, so in order to focus on that more I turned Binary IQ into Low Risk Mode. I set that to TRUE in the properties, and while I’m not getting a lot of trades, I’ve WON every single one of them. I haven’t played with this much, thanks for the advice Pauline. I have been doing the same and the results have been great for BIQ. Fewer trades but more wins. BTT is doing well along with BIQ. I only do 5 min trades for both BTT and BIQ. Can you tell us what currency are you concentrating on? I’m using all of the pairs available when I trade. So I usually still have over 20 charts open. I think it wouldn’t be enough signals if I didn’t. For the most part I’m just taking the trades, but it’s hard to avoid the trade assistant when it’s right there. SO, naturally I do look at it. Does that mean you trade every single trade that you get? And all are winners? After reading the reviews here, I have just purchased and installed the Binary IQ indicator on my MT4. I have started to receive the alerts on my email, however each time I try to drag and drop the Binary IQ indicator to a chart I get the message “Access Denied”. I have gone through the authetication process. I have sent an email to their contact page but there’s been reponse. Can anyone help please? Hi Richard, I recommend watching the members area video to see if you missed anything in the process, or entered the wrong id or username. As for support, they respond quickly, but I imagine they will tell you the same thing. My issues have now been resolved. What was the issue in the end Richard? Do you run your money management with anti-martingale and how far do you go before you reset? I use a very simple money management strategy. 2-5% of my overall account size, depending on how confident I am in the signal I receive. Can someone please help me, I don’t understand anything here. And I really want to learn how to trade. .
Hi Ron, the IQ software provides you with trade signals and tells you the exact trade to place. After you register, you get access to the members area that will show you how to set it up within a few minutes. Hi , This is EA right? Automatic 100%? Thank you and price?? Hi Pakky, this is not an EA. It is a signal system. It provides you with signals telling you the exact trade, then you place the trade. I am purchasing IQ right now, I will keep you posted with mi progress and my questions. I reside in India. Will I be able to purchase the binary iq software? How much is the software that you are selling at? Hi Jones, you can purchase and use the software in any country. For your price, go to the main website http://www.binary-iq.com. Started to get. However, confusing me. Why do I get two signals from the same MT4 sheet? This could be very confusing for the pairs where I have both M1 and M5 time frames. The first time I actually placed both trades (5 and 30 min expiry) though it was only 30 tat had been triggered, I understand now. Why just don’t keep one single message per tarde called out? okay, i’m confused.. why you say “M5 time frame (generating signals with 30 min expiry)”?!.. doesn’t M5 = 5 minute trades??.. according to metatrader it says so..
and M5 for 30 minute trades?.. Hi Loren, this is how this system works. M1 produces 5 minute expiry time trades, and M5 produces 30 minute expiry time trades. If a M5 trade (30 minutes) is published at let’s say 3:50, should the expiry time then be as close as possible to 30 minutes, i.e. 4:20 in this example? Here’s a quick sample of my latest Binary IQ trade. 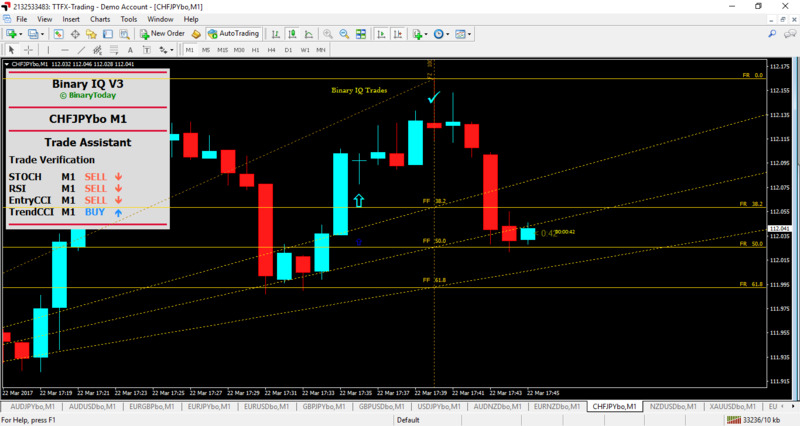 This trade is on XAUUSD (GOLD), and is a 30 minute expiry time trade. Hello John! I have a question, how link the Binary Option broker account with MetaTrader4? Hi Juan, you don’t link binary option broker to MT4. 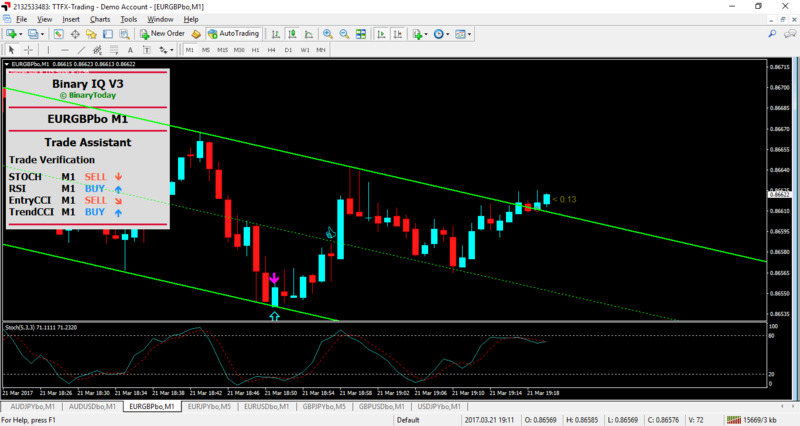 You receive the signal in MT4, and place the trade manually with your broker. BinaryIQ continues to power my trading account. I’m absolutely intoxicated by the software and what it has to offer. The feedback and conversation here is amazing. I’m so happy that we have a united front of traders here all working with one goal, to grow our accounts. Right now I’m running about 30 charts split between M1 and M5. Getting way more M1 signals than M5 signals, which makes sense but I hope that I can get more 30 minute expiry times as I’m winning these at a very high rate. 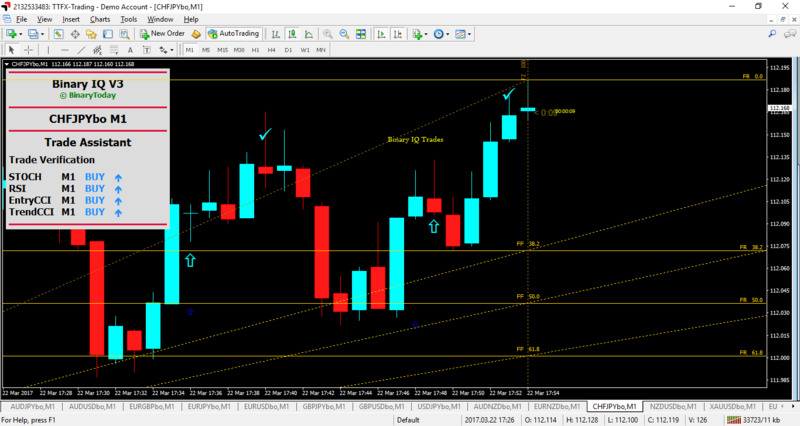 This is an awesome result Gary, how do you use the Binary IQ, i mean do you use it with the Trade assistant to ensure the 3/4 or 4/4 arrow before taking a trade or you just take the trades without it. Great results Gary! What time are you doing your trading. I trade on EST time. Is there a way to test this software in a simulator? Hi Adam, after you purchase it, you can demo / simulate as much as you like. There is no trial for the system. I’ve never had any issue with a VPS, but now all I use is my computer. Does the Binary iq signals provide buy/sell arrows on the charts or just pop-up alerts? There will be arrows on the chart as well, but all I use is the pop-up alerts. Can trades be taken without the trade assistant or do we need to use the trade assistant all the time. Are the results still good without using the trade assistant, incase we decide to take some risk? Hi Brian, the trade assistant isn’t required but I use it. At what time (gmt) matches your living results on Binary IQ? Hi Claudio, it’s GMT +3 on the sales page. Do you offer special discount for previous customers that purchased software from you (BTT/B5)? I am thinking of purchasing Binary IQ. quick one—-if i get a confirmation from trade assistance to go short in 30mins(all 4 indicators) and 10mins is already gone,do i still need to go short? or wait for the next candle. or am i going to receive an sms before i place my position? Hi Emeka, not sure what you mean. The software provides the signal, then you place the trade. If the built-in trade assistant disagrees with the trade you can decide whether or not you want to place the trade. Hi John / All, After 1 year of studying John’s work , today I purchased Binary IQ…Looking forward to this journey with Y’All 🙂 . Any words of advice for a newbee based in Western Europe ? Sounds great David, just start trading on demo and start learning through action. I am new to binary and struggling to fire up my meta trader. I need help in making it work, every time I turn it on the meta trader platform just don’t work even if I have strong internet connection. Do you guys encounter this before or any of your member? Hi Danilo, I’ve never heard of this before. Try downloading meta trader from a different broker. There are hundreds, if not thousands of options, and they are all free. it did work before when I downloaded and follow your instruction the first time. I can’t seem to fire it up anymore. What other broker should you suggest? I’m using stockpair. Hi Danilo, this is not about your binary broker. This is about your MetaTrader broker, try downloading a new MT4. I’ve been back to a very simple strategy lately with Binary IQ and I’m having a lot of success. I am looking for 4/4 arrows in the right direction from the trade assistant, and then I’m taking the trade. If it doesn’t have 4/4 I ignore the signal. With this strategy I’m up to 77% ITM this month. I’m hoping to take my $300 account and turn it into $3000. Once I complete this task I think I’ll have the confidence to start making bigger trades and taking incremental risks. Sorry for all the questions, are you using it on the 1 minute chart with 5 minute expiry and also default settings? I use both M1 and M5 but prefer M1 because that’s where I’m getting more signals. I use the default settings. There aren’t many settings that can be changed. Do you use M1 expiry or get signal on M1 but use M5 expiry? I have some questions to ask you before buying this product. 1. If I want to buy Dual package(2 License). How does it work? Do you separate them by IP address or by email? Because I want to buy it for my brother where he lives in different city. 2. From the website said that I will receive 14+ signals per day. What does it mean? Do I need to be available for 24 hours for trading or the signals will be sent after I turn on the computer? 1. Yes, by IP. You will both be able to use it at the same time. 2. You can trade whenever you like. You don’t have to be available 24 hours a day, as nobody is. When the software is running it will search the market for trade opportunities that suit your needs. Thanks for the prompt reply from Binary today. Quick question. If I want to receive more signals (High Risk) do I simply go into Inputs and change the settings. The default setting is showing Low Risk as false, is this correct in order to receive more High Risk Signals or do I have to change the Low Risk setting to True? If you want the software to be low risk, then you set low risk to true. Now, go get some wins! I’m interested in the BIQ. Is it a non-repainting indicator? Do you have any other videos of real-time signals generated and can you show us a screenshot/s of a one week/month chart history maybe on the EUR/USD showing the signals that were generated? Just to give a glimpse of the product. Sorry, just another question. Is the signal/arrow generated on the current candle or after the close of the candle? Will the trade be placed as soon as the signal is received, or do we wait for the current candle to close and place the trade at the open of the next candle? You don’t have to rely on arrows on the chart. You receive pop up alerts, that’s what you trade. You trade them when you receive the pop up. Hi Rod, a long list of signals can be found on the website. It doesn’t repaint. I’m really looking forward to giving it a go. Just one more question. On the the BinaryIQ website, are the ‘Live trading results’ based on signals taken using confirmation from the Trade Assistant or are they based on all signals without the Trade Assistant? The results are very impressive BTW. Hi Rod, that’s utilizing the built-in trade assistant for verification. You can also receive more signals on pairs not listed in the results section as well as you expand your personal tests with the IQ software. how soon should I enter my order when IQ sending it by email or sms for example? a few seconds? Hi Claudio, as soon as you can. I recommend trading on the PC. What I do is have my laptop open, and when I get a signal I walk over. I find this is the most effective method. For my job i canno’t stay in front of pc every day, i would like to use signals by sms or email and use my tablet to insert the order in the moment they arrive Is it also possible? second question: i would like to insert the signals “filtered” by the Trade Assistant, but as i told you i can’t stay at the pc…how can i do? you never thought to provide the already filtered signals? thank you for your answers and excuse for my english..
Hi Claudio, this is definitely possible. You can also trade when you aren’t at work. That’s what the majority of the Binary Today readers do. You can have the trade assistant open on your tablet as well. Looking forward to try this system! 14 straight wins with IQ. Been making sure the trade assistant is matching up and this is making it simple for me. Can you confirm for me if Grimmes is saying he uses his 3) https://snag.gy/SYu1sT.jpg (binary channel and stochastics) and Binary IQ on 1 minutes chat for 5 minutes expiry? Please explain to my understanding. Yeah. But honestly, if you just put the system on low risk and check trade assistant then you are good. Ive sent my strategy to John just waiting on him to post it. 2-0 to start with Binary IQ today. Ill update after the session today. Hi jonhn I have some doubts? 1 after grimes came on the site I no longer understand the software do you need even these indicators of it or not? Does not the software have its own strategy? He said he eliminated bad signals, did not I understand? 2 Do you use iq in what settings? Did you say that you use low risk? Hi Bruno, Grimes is providing a strategy, and a framework to use Binary IQ. You can use Binary IQ on it’s own or you can analyze signals and increase your ITM even more. Either way, you are in a great position with BIQ. You must filter out the bad trades. Im getting easy wins based on using the Fibonacci fans and ema’s. Its easy to confirm the trade will win. Grimes has been offered a spot here at Binary Today as a contributor. He has accepted, and will begin writing strategy articles showing you exactly how he uses all the signal systems here on Binary Today. We are extremely happy to have him join the team, and I know this is going to benefit everyone greatly. Are you based in the US? Which broker do you use? I’m based in the US and I’m trying to find a reputable broker. I have heard so many horror stories that I’m trying to be cautious. Please let me know if you have any suggestions. @james Im in usa. I use marketsworld mainly no withdrawl issues i just withdrew money and got it back in 3 days. Hi Grimes, where can we find Your thoughts /articles? I sent it to the admin waiting for it to post. Looking forward to seeing a video! It would be great to see this in action and also how to find, install and use the Fibonacci fans! Wrote up an article welcoming our newest strategist to the fold. Check it out here. Without these grimes settings will the software not be good? Hi Bruno, Grimes is providing a different approach that works for him. Settings do not need to be changed to be successful, and he doesn’t change the settings either. He just analyzes the signals once they come in. This is not required, but it doesn’t hurt. Yes John i will second that. The software alone works fine if you just follow all the steps. All i have done differently was add Binary IQ to my arsenal of trick’s and it happens to work really great when you add a price action strategy behind it. Honestly i feel so calm when I enter trades now because I know where its gonna land. But to answer your question you can be successful just using it how it was directed by John. Hi Nicole, this can happen from time to time. Not an issue. You can trade those if you like. Hi John – I have Binary5 already – how does Binary-IQ work together with that? Hi Stephen, great software. You can run them both in the same MT4. The setup is very similar for both. Just thought I should share this with you and every member of Binary Today. I saw a review on BinaryIQ. These guys are the ones promoting free softwares like copybuffet and NEO2. They talk about how binary options softwares should be made free and that Binary IQ is a scam. Many of us have already lost money with free softwares promoted by the likes of binary options agency. Do not listen to their ill-informed negative reviews on Binary IQ. John is a true trader with a passion for helping people succeed in creating income from trading binary options. Binary Today is here to stay and we all going to learn a lot from each other with respect to maximising our trading potential with system developed by John. I am impressed by how the website is evolving with the introduction of images being posted on trading result. We are all winners here and keep up the good work john. Thanks Des. I appreciate your kind words! These systems aren’t even free either. They force you to register and deposit with a broker, that’s not free. Yes Andrea, it’s very stable. 99% of the products in this market are automated money losers, just stay away from those and you’ll be fine. The system is great but it does need filtering. Over the past year i got really good at price action, so when i bought this product i added my own extra indicators to it to use it in my price action strategy. What i noticed was if you add Fibonacci levels to your chart plus some ema’s and something else to identify the trend its really easy to get wins. I wait on signal and cross check it with the basic market analyst of where it looks like the price is gonna go and if that doesnt add up with my view of the market ignore the trade. For money management i used the “anti martingale” i re invest only my wins. 3/ $34 win $62 = 6/1 Risk reward buys you 6 x $10 attempts to win another 3 . 6/ $210 win $389 = 6/1 Risk reward buys you 6 x $62 attempts to win another 6 / or 38 x $10 attempts. 9/ $1328 win $2456 = 6/1 Risk reward buys you 6 x $389 attempts to win another 6 / or 245 x $10 attempts. 10/ $2456 win $4543 = 454/1 Risk reward buys you $454 x $10 attempts to win another 10. I had a 40% gain today alone. I wish there was a way to add photos to this post so i could share some of my winning set ups with you guys. Hey Grimes, thanks a lot for sharing. That would be really helpful. You can upload them to http://imgur.com/ and then post the links. I’ll see if I can add it to the blog somehow as well. Grimes, I found a way. You can now add images with your comments. cool should i post it on the imgur? or another way? Hi Grimes, you can post an image now with your comment. When you post a comment you will see underneath the option to choose a file to upload with the comment. I keep tryna upload pics to the comment section but it wont let me. Ok so look at these pics. One i added a Fibonacci fan when the signal came i waited for the close of the candle. Once the candle closed i saw it was a clear indecision candle at the 38.2 bar and the trend was going up based on the fans direction. Fired up a 5 min trade and rest is history. 2nd one is with the binary channel and the stochastics. Ignore that pink arrow its just an over sold over bought indicator. Once again i waited for the close of the candle to signal a buy candlestick pattern then fired off a 5 min trade. This system is really easy when you know price action , support and resistance and fibonacci retracements etc. You can also add moving averages to this to get a better understanding of where the price will go. One thing to look out for. If there is no clear path or room for the price to go with signal then dont take trade. If you add support and resistance or fib lines and it looks like its gonna run into a wall dont take trade. Only take the trades with the room to fly. Youll get 80% win rate on the trades you do take. I find that you do have to disqualify alot of trades but id rather be 8/10 vs 8/14 any day of the week. Ill post some more trades and i do encourage you guys to post your winners and losers so we can learn and teach each other. Wow!! Grimes!! Way to go!! I am not sure if I understand all that you have put in this. By EMAs do you mean indicators like the Momentum and RSX? It would be great to see a screen shot showing which indicators you are using. You can add any indicators that give you a better understanding of price action. You just need to be able to look at the charts and have your tools tell you if you are gonna win or lose. Only take perfect set ups. I recommend learning price action trading so when the signal comes in youll know which way its going. I currently use (M) Momentum and RSX indicators with both Binary 5 and BTT. I am purchasing BIQ very soon and hope that using these indicators as well will allow for a higher winning percentage. @Grime: Hi Grimemplease can i get the arrow indicator you had on your chart post, the one which indicates overbought and oversold? I’m glad it’s going well for you Murray. Keep it up! John do you use it in the asiatica and australia section? Or does it work best in the New York and London sections? Hi Bruno, my readers are using it in all sessions with success currently. I am absolutely FLOOORED by these BINARYIQ SIGNALS. Very very very very very good !!! Are you already wearing it? I use low risk on a bunch of charts Sean. Doesn’t give a lot of signals but I win almost every low risk signal I receive. because I’m a beginner in trading. Thanks. Hi Barry, yes, there is a tutorial video in the members area. I will also be making my own video this week showing some live trades. can you best recommend I choose, Binary IQ or Binary Today 5? Hi Barry, all three are great options, I prefer Binary IQ right now because it’s shiny and new! Ill update the status tomorrow after the first session. Thanks Grimes, always glad to have you on board. Hi Grimes. Which software did you purchased and how do you like it. I have purchased few other ones and lots lots of money. Is it easy to use and follow? How is your experienced so far. I have read your other posts talking about winning but I do not understand them. Any recommendations from you would be helpful. Thank you in advance. Hi Zuzana, Binary IQ is unlike any other software you’ve purchased in the binary options market. It is not a fully automated software, like all the losers you speak of. It’s very easy to use and follow, and Grimes will have a free strategy session up next week to make sure that everyone is winning at the highest ITM rate as possible. @ZuzanaLanc The comment on this page was referring to BinaryIQ. I like this system because it goes with the trend in pullback form. Alot of indicators provide reversal trades which is fine but you really need to know price action to qualify a trade, binary IQ is slick because your on the side of the momentum and not against it. Please be on the look out for my strategy coming next week. I ended up 14-4 with my strategy. It would be a good idea to purchase the software before the strategy comes out. I bit the bullet and purchased IQ today. I usually buy all the Binary Today softwares the day they are released, however my husband was just diagnosed with stage four cancer and I am a bit pre-occupied. During the past few months I have been concentrating heavily on learning how to understand price action trading. If I understand the IQ sales copy and all of the reviews and comments, IQ will fit right in my wheel house. I look forward to seeing what IQ does during my next trading session today (Asia). There is heavy news in the upcoming Europe and New York sessions, so at the beginning of today’s Europe market I will close the charts until next week. My first trading session was abominable, however I learned a LOT. I traded the 7 April Asian session (on demo of course). I concentrated on the 5 minute expiries. I use MarketsWorld and they offer only eight pairs in the 5 minute expiries; AUDJPY, AUDUSD, EURGBP, EURJPY, EURUSD, GBPJPY, GBPUSD and USDJPY. There wasn’t any news to speak of during the session therefore price action moved very sideways and ranged tightly most of the time. I posted here on Binary Today that after the Asian session I was going to close the charts and stay out of the post-NFP New York market, but after a few hours of sleep I was determined to come back and take a peek. Almost immediately I received a signal that gave me a look into how the IQ software works – relating to Grimes’ comment about going with the trend in pullback form. You can see in this screenshot that this pair (AUDJPY) made a trip in the upward direction right after high impact news on the CAD at 14:00 GMT. It then pulled back, exhausted, and continued upward. If these are the kinds of trades I am looking for with IQ this is brilliant! I can’t stand sitting and staring at the charts for hours on end, and having IQ do the work for me is exactly what I am looking for. My first week is a SUCCESS. I made 24 trades and I won 19 of them. To some they may be like that’s nothing but to someone who’s never won in binary options it means a lot to me. I’ve tried so many stupid robots, and I’ve never made a dime. The IQ software is a truly great purchase. I’ve already made enough to pay off the purchase cost and then some. Thanks for sharing Jess. I’m proud of you, you’ve come a long way! Hi John – will BinaryIQ work with a broker who doesn’t have the 30 min. option, but has 10 min. as the closest? Hi Stephen, you can use it with that broker if they have 5 minute expiry. Hi John / All. Should I purchase Binary IQ or Binary Today 5? Hi David, it’s really a 1A 1B situation here. I’m obviously more interested in Binary IQ right now because it’s my new favorite toy but you really can’t go wrong with either. I’m really happy with Binary IQ so far. I bought this early last week and my ITM rate is 77%. I have made a couple mistakes, taking trades too late, sometimes setting the wrong expiry time. If I can clean up a few of my mistakes I should be able to get this over 80%. I wouldn’t be surprised if I can double my $3300 account in a month. I’m around 73% ITM, but climbing every single day. Not getting a lot of M5 signals though, mostly M1. Hi Dana, this does seem to be pretty normal. The strategy is very tight when it comes to the 30 minute expiry signals. This makes them very high probability winners, when they come. I mainly get M5 signals, which I have set to expire in 30 minutes. My first week my ITM is like yours around the 73%. Can you explain the best time to set expiry. for example if on the 30 minute expiry timeframe and a signal is generated at say 16:10 what time would you set the expiry? Hi Craig, I would use 16:40 if available, if not 16:45. Will this system works well with IQ Option or is there any other recommended binary broker. Hi Adnan, you can use any broker you like. It works great with IQ. I traded on the 8th March, took 11 signals, 9 ITM, 2 OTM, but i must emphasis you need to use the trade assistant to quantify the trade, like John explains. I am only trading the 5 minutes for now. Just came across this and still reading up on it. You mention above in one of your responses that you always use your “trade assistant” before placing every trade. Can you please explain what is your “trade assistant”? It’s built into the software Emile. It shows 4 arrows based on different indicators that signify the direction of the market. These can help verify signals. If they are all in agreement, then the signal is a very high probability trade. Binary brokers,there are so many bad ones.Who can you recommend as good and trustworthy?? We constantly update this to ensure the best brokers are being utilized. Hi John, Do you have a live demo I could use to verify signals? I live in Australia and the time difference is substantial. Hi Brian, many of the readers here are at Binary Today. They use the software in your time zone. Day 2 has been a little slow but I’ve won all my trades. The market hasn’t looked great so I guess it makes sense. Maybe I’ll open up more charts. Trading the New York session mostly. Day 3 has provided a bunch of solid 5 minute expiry time trades. Not many 30 minute expiry time trades. Lastly, how do you verify trades? Do you use momentum alongside trade assistant? Jane what hours have you been trading during the new York session? I have been following you for months. I will like to try this binary IQ indicator and I am very sure that I will come back here to give feedback…. Hi John, got the BTS up and running both on M1 and M5, So far I am getting good results, be they few, but still early days. So question is can I add more pairs more than the recommended 7 in the members area? And if so what additional pairs do you recommend? Hi Shaun, of course you can test more pairs. I recommend seeing what assets are available with your broker when you trade, and add those. Does it really matter which pairs? As long as there is action or volatility shouldn’t that be the criteria to get more signals we can consider? You can use any asset and you will have more opportunities to trade Spence. How do you verify your trades and what trading session you trade? Sounds great, let me know if you need any help. Absolutely George. Works great on MAC. does this software require a person to be experienced in binary to use it ? Hi Lebohang, no. One of the first points in this review where you are commenting, I mention that it’s great for new traders and veterans. Do you use this with your trade assistant? Hi TJ, I use my trade assistant with every signal service or software that I use. Doesn’t hurt to be careful when trading. Quite impressed with the accuracy of BTS so far. I will be keeping track of my ITM% with this one and report back. Been getting a perfect amount of trades between the IQ and Binary5 all day. Great Vince! Glad you are liking it so far. Do you verify your trades only using trade assistant or do you have something else? Signed up this morning, 4/4 ITM. does the new strategy require any additional vetting before one place the trades? I.e. is it totally standalone and can I set-up my MT4 running at home and I place the trades when received on my phone? Hi Pieter, additional vetting isn’t required. Do you have a video with live trading we can see? Also how many signals does the system give you for each currency pair each day (on average)? Hi Kim, as for how many signals, I recommend going through the results on the web-site. Live trading video will be something we put together in the coming weeks. On the BTS site where it shows daily trading results of trades taken, what level were these taken at with the “enhance risk level”? Also this looks like another winning system on top of BT5 as well. Hi Angel, the daily trade results are not using the light risk module. This is off by default, but can be activated at anytime for lower risk signals. Wow John!!! Here it is!! The extensive research and testing with this latest software is over the top!!! World Class, as always. I just purchased it and loading it up. Thank you so much for this awesome product. Will be in touch with my results. All my best!!! Jim C.
After purchase, on what time frame do I set my MT4 is it 5 or 30 minutes? You will set 1 chart to M1 and 1 chart to M5. It shows this in the members area video for you. It’s ready, I hope you are! is it a good idea to have also binary today 5? Yes, I will still be using Binary Today 5 actively. Do you have to open each pair in both a 5m and 30m window in MT4? Hi Josh, you do it just as the video shows. With this software we send 30 minute and 5 minute expiry time signals. You use M1 to receive the 5 minute signals and M5 to receive the 30 minute signals. This is shown in depth in the members area video.